We consider popularization of our results to a wide circus of people, not only to specialists in bioacoustics, as a very important part of our work. Most probable, specialists working in neighboring fields of science and especially people, not belonging to scientific community, are not ready to read papers published in special scientific journals, but they can make up an impression about our work from reading popular papers. So, we publish a popular paper on each our completed research. Volodin I.A. Sounding dogs // Russian dog fancy magazine “Droug”, 2002, № 11, p. 22-24. Volodina E., Krasnova E. Explanatory dictionary of beast talk // Science&Life, 2001, № 9, p. 38-44. 401.pdf. 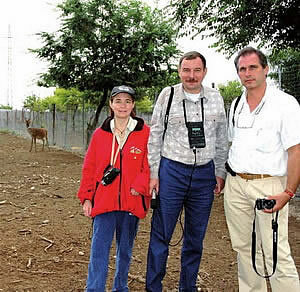 Markina N. Goitred gazelles in Uzbekistan are at the edge of hunger // Informational portal "Infox-Interactive", 2010. Markina N. Moscow biologists decoded the language, common for humans and animals. // Informational portal "Infox-Interactive", 2009. Patrusheva E. Good owner always knows about what his dog barks // Russian dog fancy magazine Droug, 2006, № 10, p. 58-60 and № 11, p. 54-56. Maximov N., Ljvova N. Silence of wolf-cubs // Paradox, 2003, № 10, p. 62-66. Radio “Svoboda” (program I. Pomerantsev “Above barriers”). Discovery Channel Online News in the United States. © Volodin`s bioacoustic group, 2010.